Tim Realbuto may be the first person able to live in the past, present, and future simultaneously. Best known for writing and composing the Broadway-bound musical Ghostlight with Matthew Martin, Realbuto now exorcises his own ghosts in Wunderkind, a not-so-solo exploration of his thirty years of life thus far. A musical journey about identity, sexuality, and the pain and complexities involved in growing up, Wunderkind follows Tim through his time as a successful child actor in TV and movies like The Sopranos and The Emperor's Club with Kevin Kline to his quarter-life crisis and reinvention as a writer. Backstage gossip and entertainment in-jokes abound, but the show has a beating heart beneath its tongue-in-cheek humor as Realbuto learns the hard way that the realities of adulthood often don't match our dreams. But our hero can't carry on alone; he needs an ensemble of supporting players, and what a team he's compiled! Wunderkind features a rotating cast of Broadway luminaries including Ariana DeBose (Pippin), Jenna Leigh Green (Wicked, Sabrina the Teenage Witch), Kimberly Faye Greenberg (One Night with Fanny Brice), and Laurissa Romain (South Pacific) as the incidental voices in Tim's head while he relives his most intimate memories. "I don't like to look at it as a cabaret or a concert," Realbuto says of the somewhat genre-busting project. "This is a book musical. I have a script; the whole cast gets a script. [They're on-book during the performance.] And everybody thinks I'm playing me, but the only way I'm able to get through the show without freaking out is to tell myself I'm playing a character. And to have these great, great people who are so much more famous coming onstage, game for anything, to support me? They're amazing. I can't believe I get to work with them." 2014 has indeed been full of wonders for Realbuto; Wunderkind's predecessor Alone With Plenty of Help, which he performed in July at 54 Below, marked his first time acting in three years. 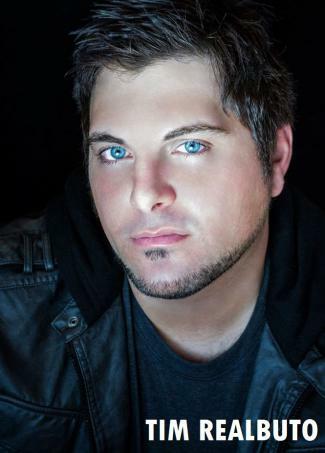 "I had taken the time off to write Ghostlight and other projects. But I missed performing so much, and my family and friends saw how much I missed it. I felt like I was always saying, 'Ugh, I'm a writer now.' I love writing, I do, but part of me was like, 'What's missing? What's missing?' And then I got up onstage and said, 'Thank God! This is what's missing!'" The original plan had been for Tim to perform at 54 Below with actress Anneliese van der Pol (That's So Raven), who had earlier starred as Olive Thomas in an industry presentation of Ghostlight. But when van der Pol's filming schedule caused a conflict, friends encouraged Realbuto to create his own act. "I'd had an idea for a show for a few years," he recounts, "so I wrote it down and said, 'I'll see if I can get some really cool Broadway people to come help me out,' and they did." Lest fans of solo shows be skeptical, what Realbuto has crafted in Wunderkind is truly a unique undertaking. Most of the focus remains on Tim and his experiences, his larger-than-life ebullience a perfect fulcrum for the circus of guest stars and theatrical jukebox music -- songs plucked from the canons of Stephen Sondheim, Irving Berlin and others mixed with original tunes -- to pivot around. Audiences may amuse themselves playing Broadway Bingo as actors pop up here and there to illustrate Realbuto's anecdotes before slipping back into the wings, but the rapid passage of personalities never gets distracting. It takes a prodigal talent to merge these disparate pieces together into one coherent, effecting plotline. And perpetually there is the element of truth to the proceedings. "As I was writing Wunderkind, I thought to myself, 'I would like to become the Kathy Griffin of Broadway.' I'm going to speak my mind and I don't care if I get in trouble. And I always try to find something that scares me for every show. "What did I say I would never do in a million years? What's one thing I would never think about doing onstage ever?" The first time it was me airing all this personal stuff onstage -- that's just every show now -- and doing a ten-minute impersonation medley with Christina Bianco. The second time it was singing a song that's a little bit out of my range. It was so scary, but also so rewarding." For his upcoming shows at the Laurie Beechman Theatre (featuring special guests Laura Osnes and Christine Pedi) and Joe's Pub, Realbuto will be doing celebrity impressions all by himself, but he also continues to challenge himself in ways unrelated to Wunderkind. Tim currently has a thriller screenplay called The Hyde Club in development, and while he and Matthew Martin -- who have known each other since age three -- make workshop revisions to Ghostlight, they are also composing a number of children's shows to be produced in Brooklyn and have another passion project musical in the works. Will Realbuto ever do a truly solo show? "At the end of the year I'm taking the show to Orlando," Tim enthuses, "and that's going to be Wunderkind without all the frills. But," he adds slyly, "I think I have one cast member [Avenue Q's David Colston Corris] who will happen to be down there, and he's going to do it with me." So maybe the wonder boy still needs a collaborative boost. That's okay too; he's got the It Factor regardless. Collaboration, in fact, is a big part of what drives Realbuto, and the New York theatre community's habit of giving and supporting worthy causes means a great deal to him. The next two performances of Wunderkind will donate a percentage of the ticket sales to the National Multiple Sclerosis Society in honor of Realbuto's mother, who suffers from the disease, and God's Love We Deliver in memory of Joan Rivers, who had named the food provider organization as her favorite charity. "The Beechman was [Rivers'] old stomping ground," Tim notes, "so I want to do something for her. Performing is one thing, but performing for a cause where you can make a difference? That's even better." So while he ponders his past, plots his future, and makes fun of his show's title ("In all honesty that word's just there for comedic effect. I don't want people to think I'm actually calling myself a wunderkind; I know I'm not"), Realbuto has found the key to living fully in the present. Do what you love, and do unto others. The rest will find you somehow. He concurs, "At the end of the show I say, 'I'm not rich, but I refuse to work at a job I hate so that at the end of my life I have some money, but I never really lived.'" Pretty smart for a newly minted thirty year old. Don't be so quick to self-deprecate, Tim. You really might be a wunderkind after all. 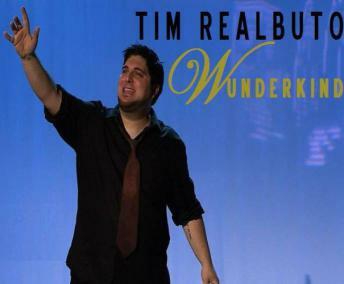 Tim Realbuto and guests perform Wunderkind at the Laurie Beechman Theatre on October 13th and Joe's Pub on November 2nd. Find more information here.